A long and proud history of performance reliability earned us a reputation of being "Capable People You Can Count On!" 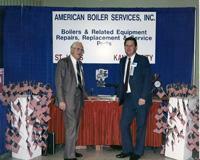 American Boiler & Mechanical was formed in 1973 by Harry Hemphill. When the company opened we were in a small shop in Fenton, MO with nothing more than a small office and a shop just big enough to park a utility truck. As our company has grown, we have moved to accomodate our needs; once to a larger facility in Fenton, then to the historical area of St. Louis known as "The Hill." Our facility houses several offices and a 25,000 square foot shop on a lot that is close to 2 acres. In the 1988 we began our expansion and opened a branch office in Kansas City, MO and 1998 an office in Salina, KS. Between the three offices we are able to service several states. Originally our fleet and tool supply consisted of our employees driving personal vehicles to service jobsites with communal sharing of all tools and equipment. We have since grown to a fleet containing 65 trucks consisting of mobile cranes, 3 flat bed trucks, and 55 service trucks, several containing mobile welders and all containing enough tools to do everything from re-tubing a boiler to piping in new equipment.